There are several different tools we use for managing Tasks and Projects between our desktops and iPads. OmniFocus and Things are two major players in this area. One that is missed is ToDo from Appigo. We don’t use ToDo for major projects but it’s a big win in our ongoing task lists at work and home. 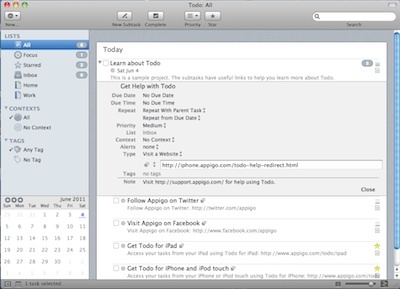 In simple terms, ToDo items are easily set up in groups on the Mac or iPad, synced through an inexpensive or even a free Cloud option. Making it great for work and even better for around home across many family members. The iPad and Mac versions are sold separately, both through their own app store. Both can be installed on as many devices that are on that account so keeping everyone in sync is pretty easy. The Mac desktop version is more Mac like than looking like it’s paper counterparts. The actions are more Mac like as well than you expect with a iPad. Double clicking, expanding and dragging around. The grouping by when the Task is due, tags and project is the same between the Mac desktop and iPad version. Below is a high level task for today. Choosing the task can expand the view to see the sub items needed to be completed. Coding can be put against any/all of these so different people can work items needed to compete the overall task. Levels can also be set so that more important items can raise to the top of the list as needed. Each of the parent or sub items can have a full level of detail all of their own. The quantity of this information can be shown or collapsed as needed. Even on the launch of the Mac desktop app, the info can be set to show maximum or minimum information. 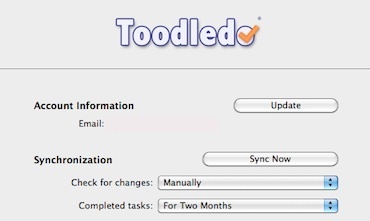 Repeating tasks is a feature we use a lot in ToDo… amazed that more Task Managers don’t offer this feature. 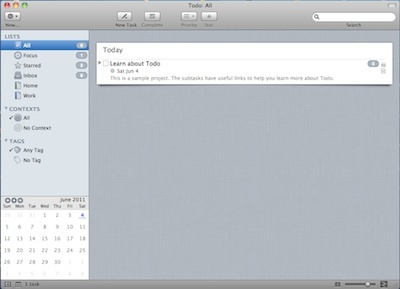 The Mac desktop version of ToDo offers all of the usual individual item fine tuning that the iPad version does. These sync across between the two devices so you don’t loose any of the special particulars needed to complete the task. Family and Co-Workers have enough info to dive in without having to reach back to the creator to understand. 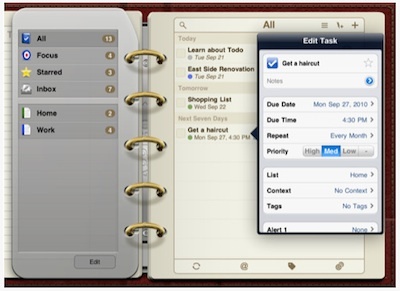 A right-click on any task within ToDo for Mac will allow you the usual copy/paste/duplicate, as well to mark completed. The ability to remove the Due Date or switch the type of Task from here is handy too. When you are ready to share the tasks between Mac desktops and iPads, you can choose to do so over your local network or out through the Cloud. 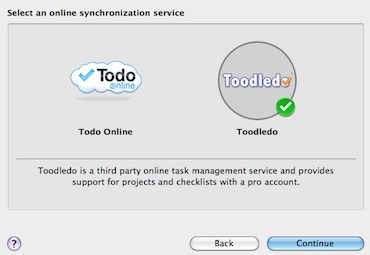 If you choose the Cloud option, ToDo for Mac offers the cloud service offered by the dev group Appigo or an outside cloud provider Toodledo. 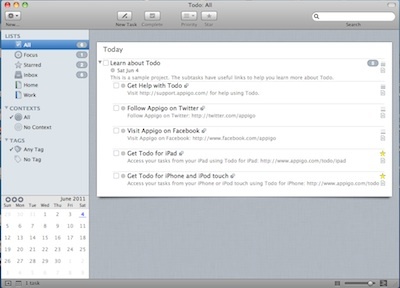 The Appigo “Todo Online” option is a ‘for pay’ service. The Toodledo cloud has a free version and multi levels of ‘for pay’ depending on the features you need. 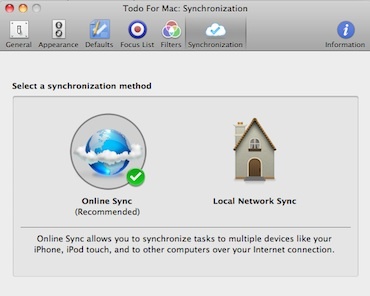 With either of the Cloud services chosen, you can set up the account of the Cloud and how often you want your ToDo Mac to sync up to be shared with other Mac and iPad users.